Wendy climbs in a box, making sure it's empty! We hope your holiday is as full of love and joy as ours! Once upon a time, I was creative. I loved anything artistic. Paper, clay, photography, yarn or thread. If I could make something with my own two hands that was useful or beautiful, I was into it. I shared much of what I did freely, and the internet enabled me. As time went by, though, I got discouraged due to the fact that more and more, I found my freely shared 'artistic creations' stolen, and sold for a profit. So I took most of them down. I'm reconsidering that decision now, as I am not getting any younger, and it seems there isn't anyone around here to pass my passion on to. To make a long story short, I've decided to start with a Christmas gift from me to you. 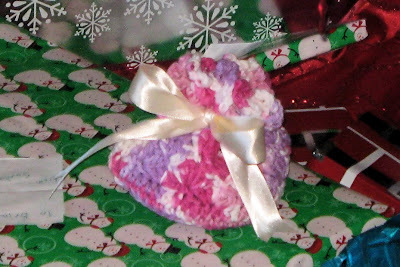 It's a crochet pattern for what I've named a "Tea Bag Stocking". 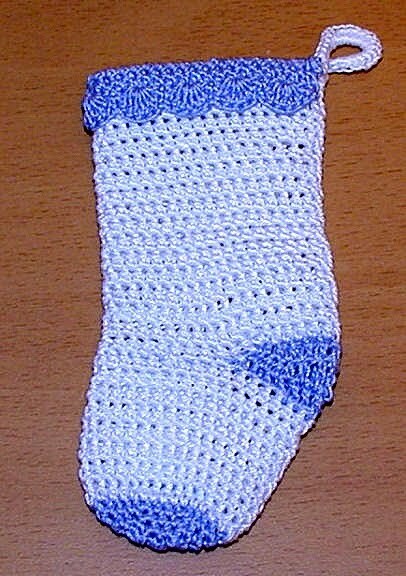 I designed this little stocking as a gift to include with my Christmas cards one year, and made with size 10 crochet thread, it's the perfect size to tuck a couple tea bags or other small notions into. It can also be made with yarn. 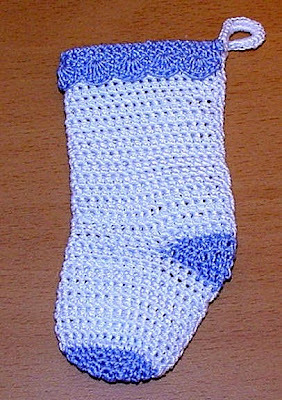 two colors of size 10 thread, one for the toe, heel wedge and cuff, referred to as Color A, and one color for the main body of the stocking, referred to as Color B. 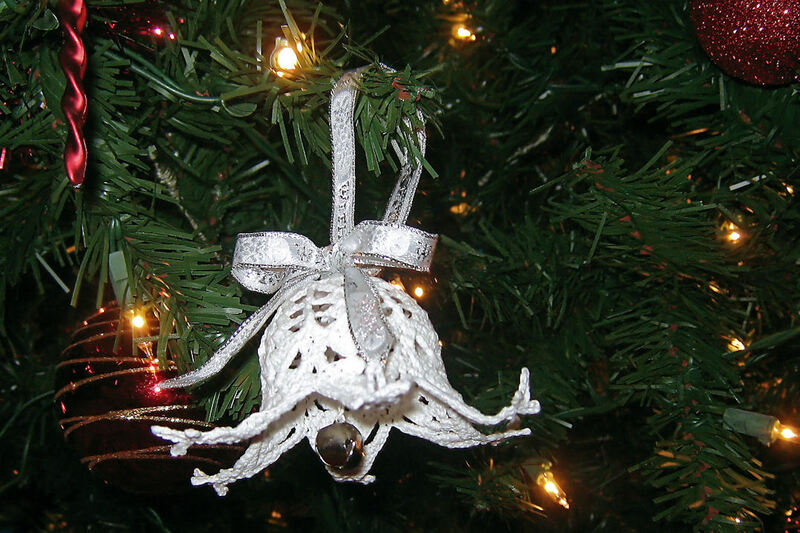 You may also like to add a small amount of metallic thread as an accent for the finishing round/hanging cord. two colors of ww yarn, one for toe, heel wedge, and cuff, referred to as Color A, and one color for the main body of the stocking, referred to as Color B.
Rnd 4: *1 sc in next 2 st, 2 sc in next*, repeat from * to * around (32 sc) fasten off color A. Row 1: Work sc, sc, hdc, hdc, dc, dc, dc, dc, hdc, hdc, sc, sc. Ch 1, turn. Row 2: Work sc, hdc, hdc, dc, dc, trc, trc, dc, dc, hdc, hdc, sc. Ch 1, turn. Row 3: Work sc, sc, hdc, hdc, dc, dc, dc, dc, hdc, hdc, sc, sc, fasten off color A.
Rnd 14: Pick up the loop you saved with the stitch marker, and hdc around placing a hdc in each row of heel for a total of 38 hdc. Rnd 29: Sc in next st and in each st around. (38 sc) sl st in next st.
Row 31: Hdc in each st around (38 hdc) Join with a sl st, ch 2, turn. Row 33: sc in first st, *sk one hdc, work 5 dc in next hdc, sk one hdc, sc in next hdc,* repeat from * to * around.Join with a sl st in first sc. (10 sc, 50 dc) Fasten off, leaving a long end to tack cuff down if desired. Tack cuff down. Row 34: Fold the stocking flat to locate the back of the stocking. Join color of your choice (I used a small amount of gold metallic thread or a fancy metallic yarn as an accent for this round, but you may want to use color A or even color B) in the blo of the last round of the stocking with a sl st, ch 1, sc in same st, sc in each blo st around (38 sc) Ch 15, join with a sl st to first st, ch 1, DO NOT TURN. Row 35: sc in each st around. (38 sc) Sc 25 st in the chain, then join with a sl st in the first st. Fasten off. Weave in all ends. Life has been sweet around here today! My granddaughter and I made peppermint bark last night, and we've all been munching on it. 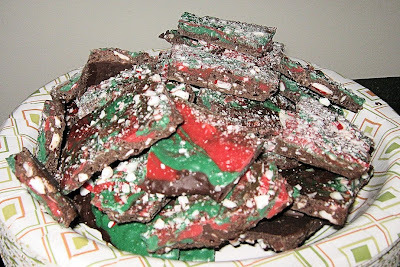 I don't care for white chocolate, so we used dark chocolate, with just a little red and green candy melts swirled in for that "Christmas-y" appearance. 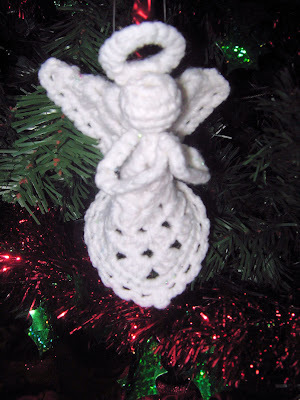 I also made three little Granny Square Angels for our Christmas Trees. I was a bit fooled by the title, 'Granny Squares'. I can crochet granny squares, they're easy and fast! But I was thrown by having to crochet around chenille stems for the wings, dress, halo and arms. The project took a while longer than I thought it would, but I'm quite pleased with the results. 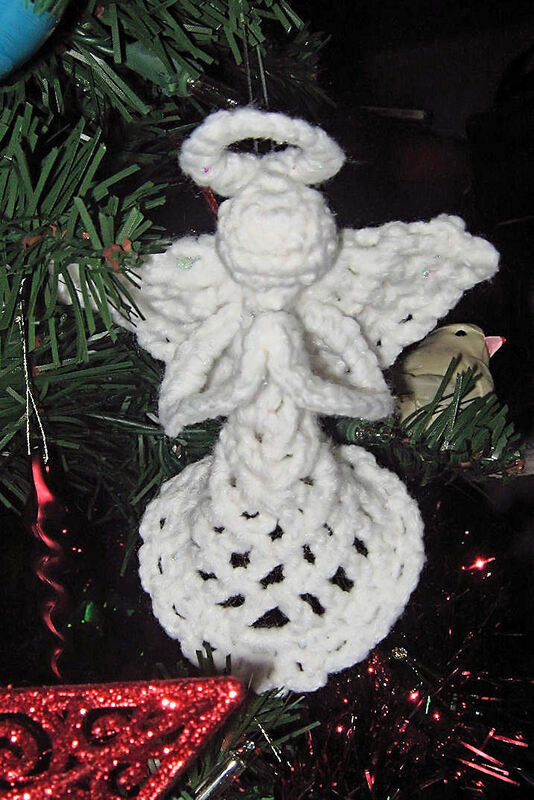 Free Pattern for the Granny Square Angels can be found at Priscilla's Crochet. Have You Ever Done Such a Thing? My better half and I were coming home from shopping yesterday, and as usual, were listening to the radio. 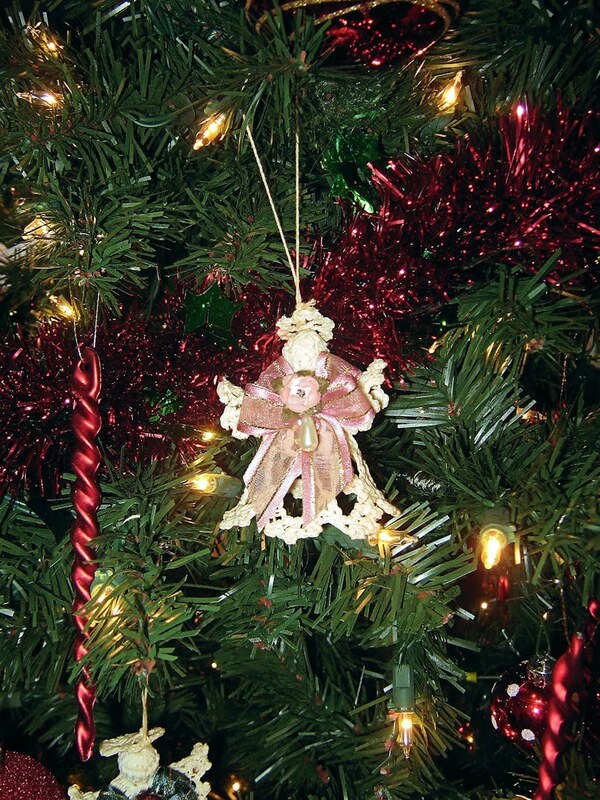 I love this time of year as you can find stations that play nothing but Christmas music, 24 hours a day. The DJ caught my attention when he asked "Have you ever bought Christmas presents that didn't make it to under the Christmas tree?" It was the intro for a commercial for a security system, but it reminded me of an event that happened when my children were little. I'm not the most organised person in the world. Are you surprised? Well, this one particular year, I was determined to change, so I went out Christmas shopping in September, instead of waiting for the last minute. I didn't buy everything on my list, but filled two shopping bags with my purchases. I brought them home, wrapped them up, and then hid them. This is the important part of the story. My son, when he was growing up, was the best gift seeker I've ever known. 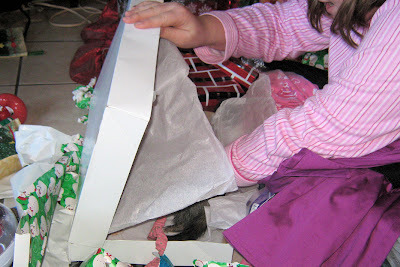 I had to be extremely clever in finding hiding places, or he would not only find every present, but many times, he'd share with every one else what they were getting as well. 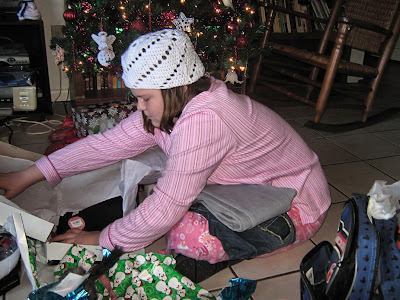 I really outdid myself when I hid those gifts. 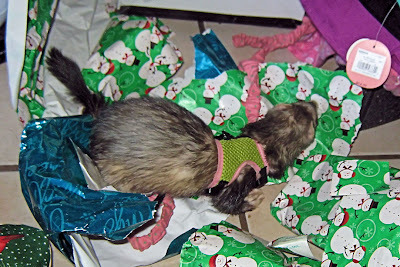 As Christmas approached, I bought and wrapped more toys and clothes, and then did an inventory of the various piles. 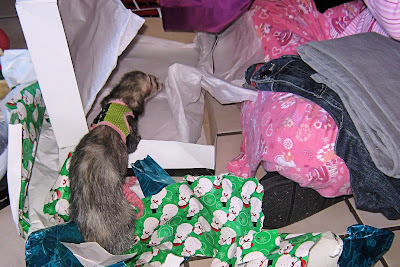 I couldn't understand why there weren't more gifts. Yes, I can see the light dawning, I forgot about the gifts I had bought way back in September! So I went out and bought more things to make up for my shortcoming. It wasn't until the following June, when we were packing up the apartment preparing to move, when way back in the top of the closet, we found the bags of forgotten Christmas presents! We had an unexpected 'Christmas in June' that year, and my kids haven't let me live it down to this day. told them - Be not afraid. of that one brief moment. 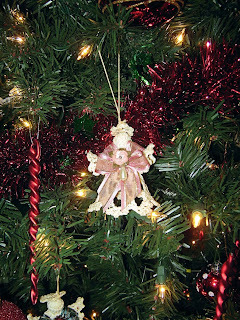 It's beginning to look a lot like Christmas here, at least inside the house. I don't think I'll ever truely get used to a green Christmas like we have here in Florida, but I do appreciate not having to deal with shoveling snow off of the sidewalks and driveway, or having to scrape ice off the windshield of the car before driving any where. 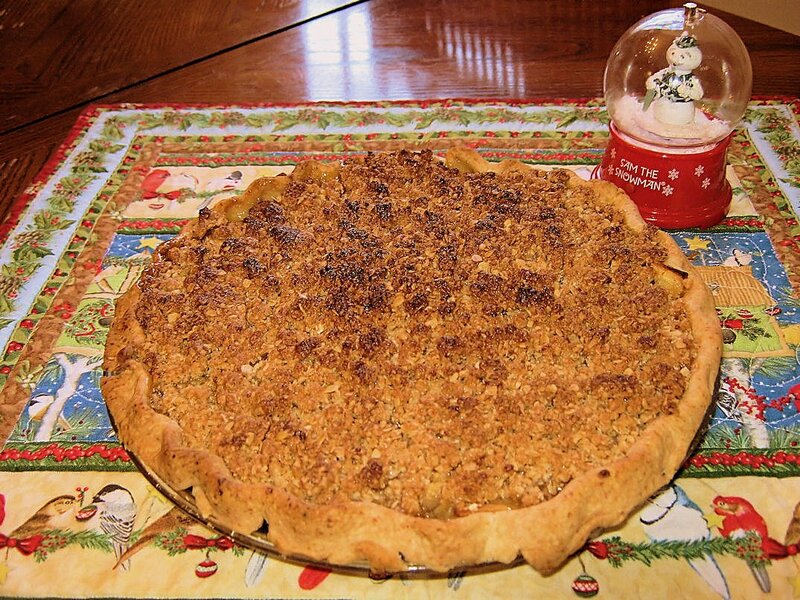 I thought I'd share a little of what I've been up to, holiday-wise. 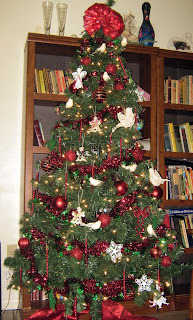 This is our 2010 Christmas tree so far. Did I happen to mention that I love Christmas? My beloved and I have a tradition of setting up the tree on Thanksgiving Day, and we usually do each years tree in a color theme. This year, it's red, white, and green, just in case you couldn't tell. 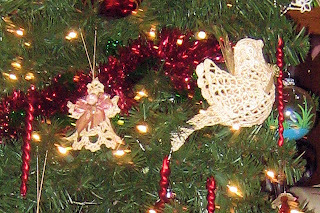 These are two of the oldest ornaments on our tree. 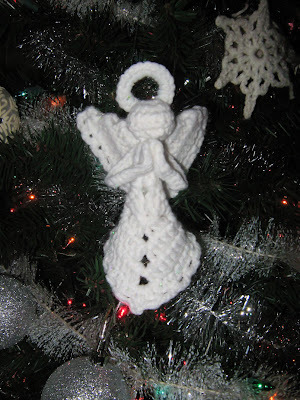 I don't remember where or even when we purchased them, but they are hand crocheted (I believe) and I adore them. I am big on handmade/homemade/crafty things. As we hung our ornaments this year, I was thinking, 'I wish I had more ornaments like these!' (We only have three angels and two doves like these.) Since money is very tight this year, I knew better than to try and shop online for more. 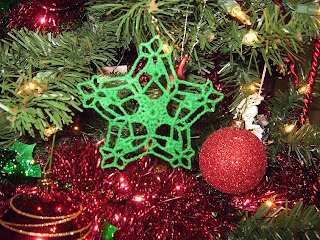 The good news is, I DO know how to crochet, and there are hundreds of free patterns for crocheted ornaments and decorations available on the internet. I turned to one of my very favorite websites, http://www.crochetpatterncentral.com/directory.php , for assistance in my search. While she is not like the tinier angels we purchased, I think she has a beauty all her own. And this is just one of several Star in a Star ornaments that I made from a pattern I found at jpfun.com . I actually made over twenty of these pretty little stars in red, white, and green, but most of them went to my granddaughter, Brianna's Girl Scout Troop for gifts at their Christmas party. 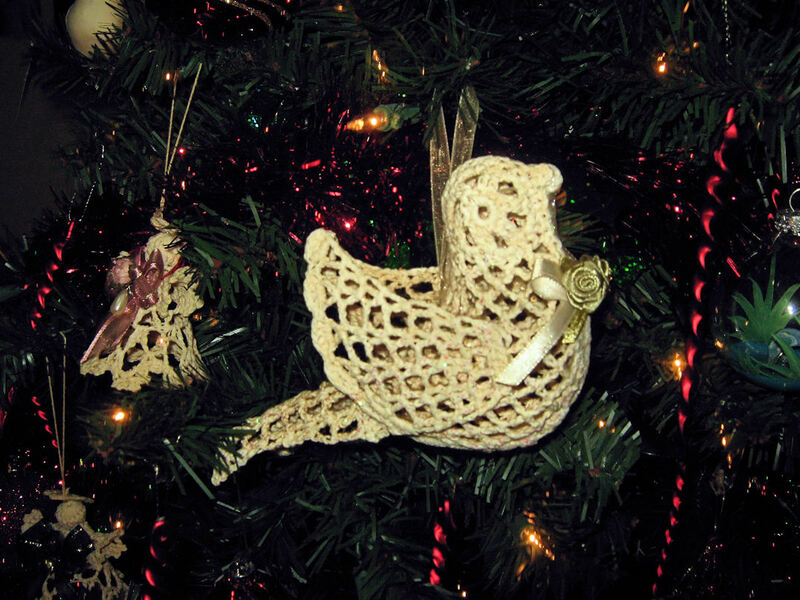 I thought you might like a close up view of the crocheted dove ornaments. 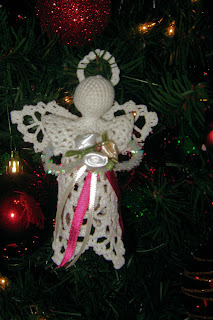 Close up of one of the purchased angel ornaments. This is the latest ornament to hang on our tree. It's a Bell Flake, and I found the pattern at my newest favorite website, Snowcatcher. She designs the most amazing crochet patterns, and I wish I could show you more of what I've made from her work, but unfortunately, I've sent them out as Christmas gifts. 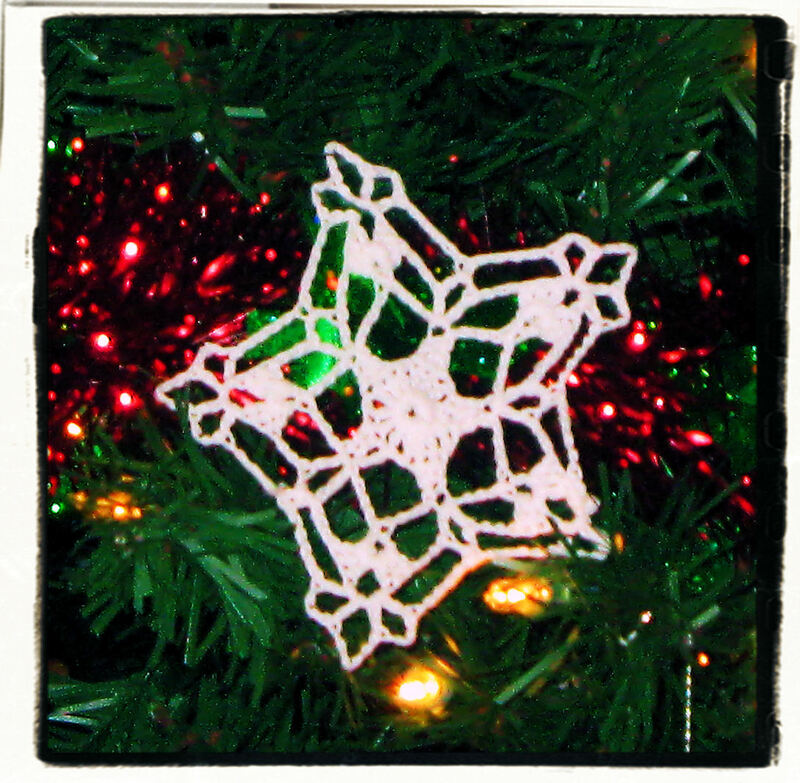 The nice thing about her crocheted snowflakes are they can fit right inside a greeting card, and be mailed. If you don't put too many snowflakes in the envelope, you don't even have to pay extra postage! Forgive my funky formating in this post, please. I'm trying Picasa to upload and blog, and it didn't load all the photo's I selected the first time. I'll try and post more of the ornaments I'm making as I complete them. 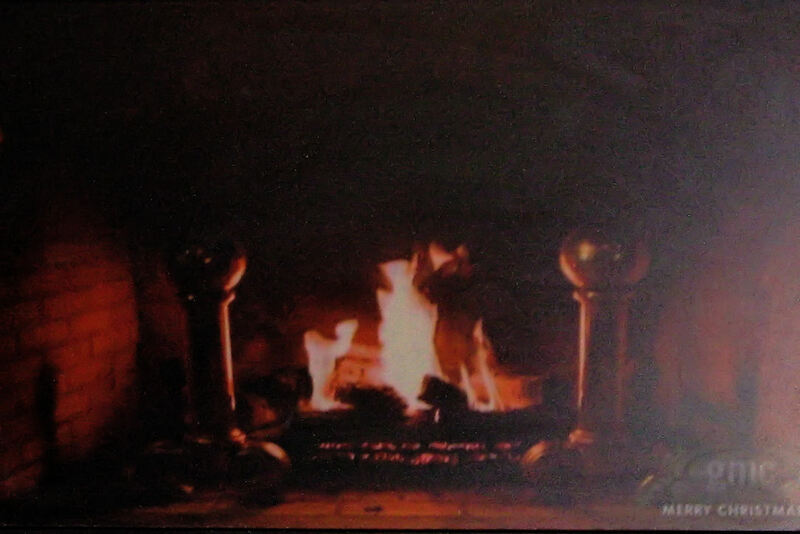 Until then, I want to wish all a very happy and healthy holiday season! I'm almost embarrassed to admit how long it has been since I have blogged. I even wondered (for just a minute or two) why it was I stopped blogging, when I did so often four years ago. (By the way, this was not the only blog I was writing four years ago. I actually maintained 4, yes, four, blogs at one time, all for different writing styles or subjects.) But the realization that I was spending up to eighteen hours a day writing or working on writing and no one was reading or reacting to my hard earned words finally drove me to give it up. There was absolutely no reward as far as I was concerned. I mean, if I had even a little feedback on what I was putting so much effort into, I might have continued doing it. Needless to say, there wasn't. I'm back now, and ready to give it another try. My life has changed in many ways in the four long years since I last wrote. One thing hasn't changed? Life is still a drama!